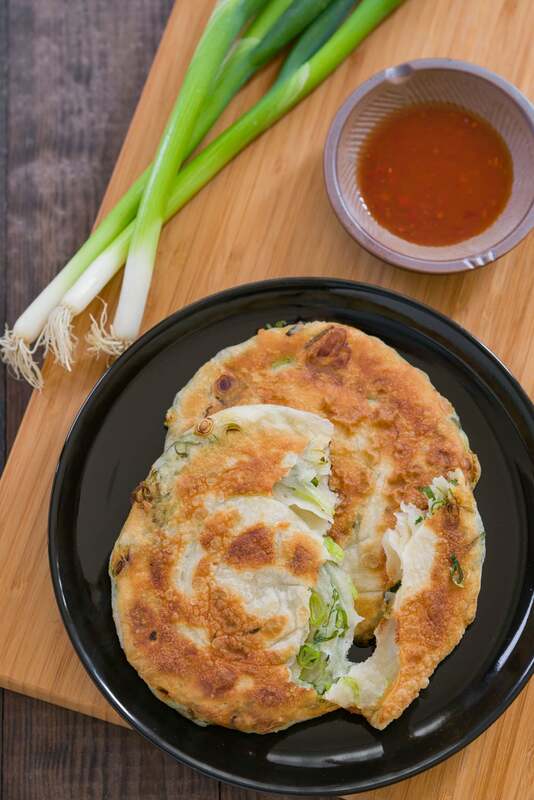 A great scallion pancake is crunchy on the outside and tender and a bit chewy on the inside. Loaded with scallions and redolent of toasted sesame oil, it makes for a great appetizer, snack, or meal on the go. 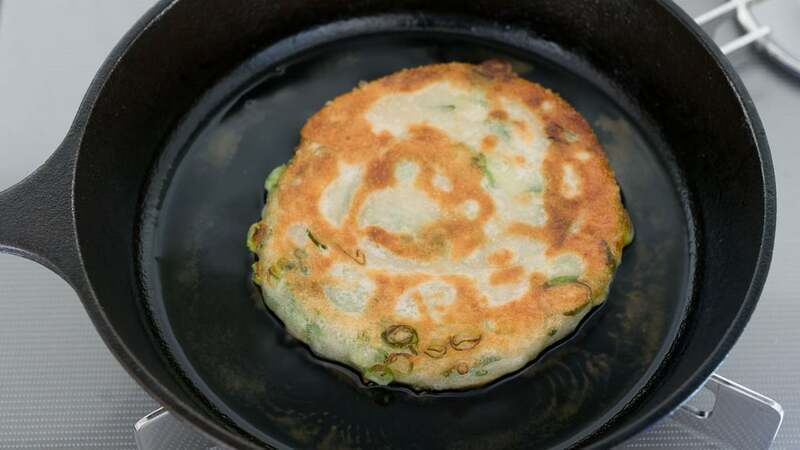 My first experience with Cong You Bing (葱油饼), or scallion pancakes was in Shanghai a number of years ago. I was staying in one of the city’s first boutique hotels, complete with a modern reclaimed wood interior. It was great, except within the confines of the hotel, I could have been in any city in the world. On my last day there I asked the front desk if there was a great place for scallion pancakes. The lady gave me a quizzical look as if sizing me up for the level of grit I was willing to put up with. Seemingly satisfied she called the porter over explaining that it’s a snack she hasn’t indulged in since she was a little girl. Moments later I was in a cab being whisked through the streets of Shanghai headed further and further from the glitzy modern neighborhood I’d become familiar with. Just as I started questioning the wisdom of my inquiry, the driver pulled over and pointed across the street to long lineup of locals along a brick wall. As I crossed the street, the heady aroma of fried dough and caramelized scallions caught my nose and reeled me in. After about thirty minutes in line, I reached a gap in the brick wall that looked onto the veranda of someone’s first floor apartment. On one side was a makeshift fryer made from an oil drum, and on the other, a small work surface where the guy making the pancakes was hunched over rolling out dough, while he took a drag from a cigarette hanging limply from the corner of his mouth. I ended up getting a bag of 6 pancakes for less than a dollar. They were extremely dense and greasy and tasted of oil that had been recycled one too many times, but there was something about these cigarette ash sprinkled pancakes that stuck with me long after my visit and caused me to have cravings. Perhaps they were laced with opium, all I know is that when the mood strikes for some savory fried dough, a few scalllion pancakes is all it takes to slay the hunger. 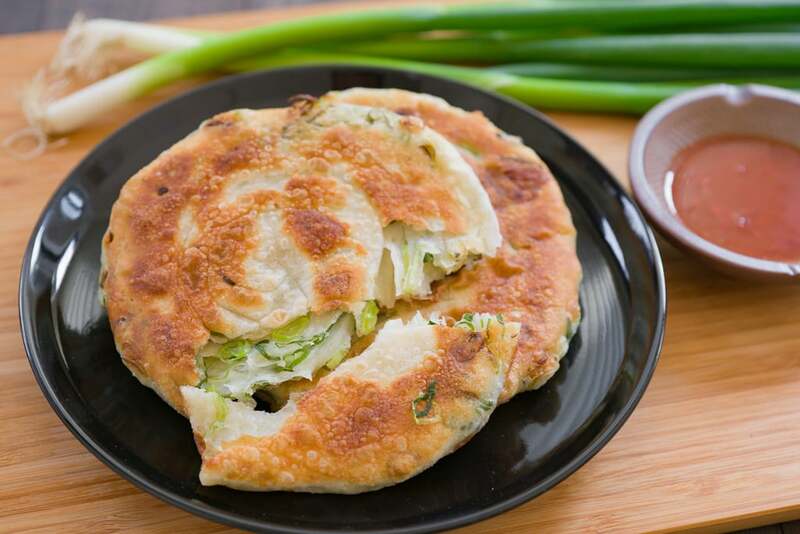 Despite the name, scallion pancakes are actually more of a flatbread than a pancake. 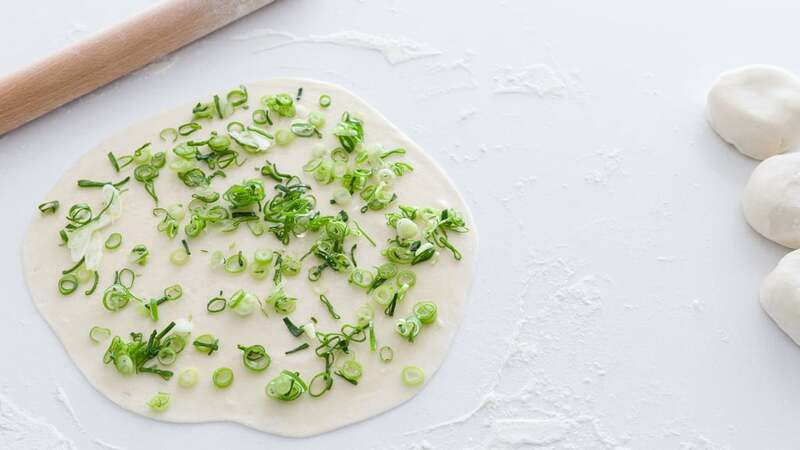 Made from unleavened dough that’s rolled into layers with scallions and oil, they’re crisp and flaky on the outside with a soft, chewy center. It’s this juxtaposition in textures along with the sweet fragrance of the caramelized scallions held within its folds that keeps you going back for more. I think these are fantastic as is without any dipping sauce, but if you have to have a condiment, I recommend a 50:50 mixture of rice vinegar and doubanjiang for a tart spicy kick that offsets the sweetness of the onions and density of the pancake. Add the flour, salt and boiling water to the bowl of a mixer fitted with a beater attachment. Mix on low speed until the dough comes together. Switch attachments to the dough hook and knead at medium low speed until the dough is smooth and not super sticky. 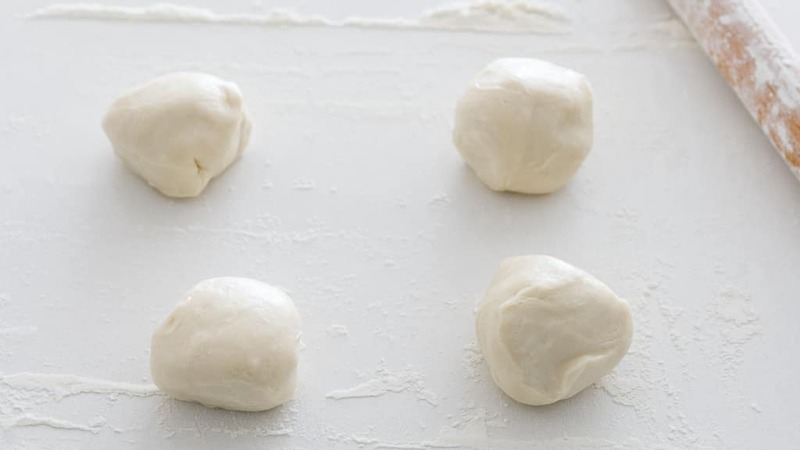 On a well floured surface, cut the dough into 4 equal-sized pieces. Shape each piece into a round puck. Using plenty of flour to keep the dough from sticking, roll one of the pucks out into an 11-inch (28 cm) disk. 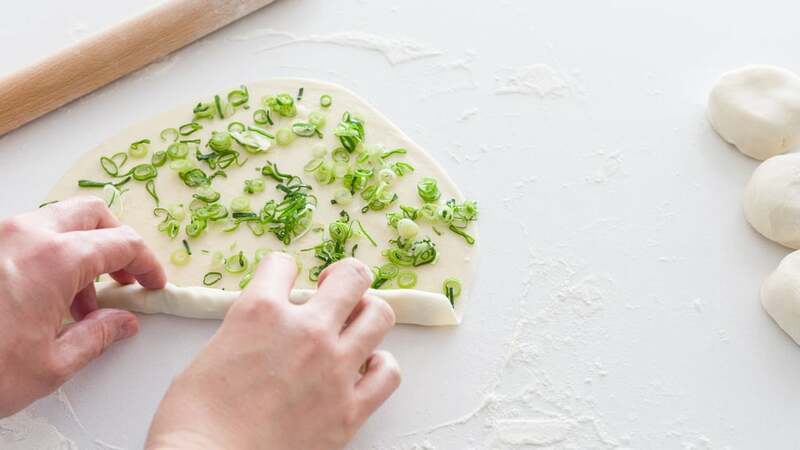 Evenly distribute 1/4 of the chopped scallions on top of the dough and then sprinkle with a pinch of sea salt. 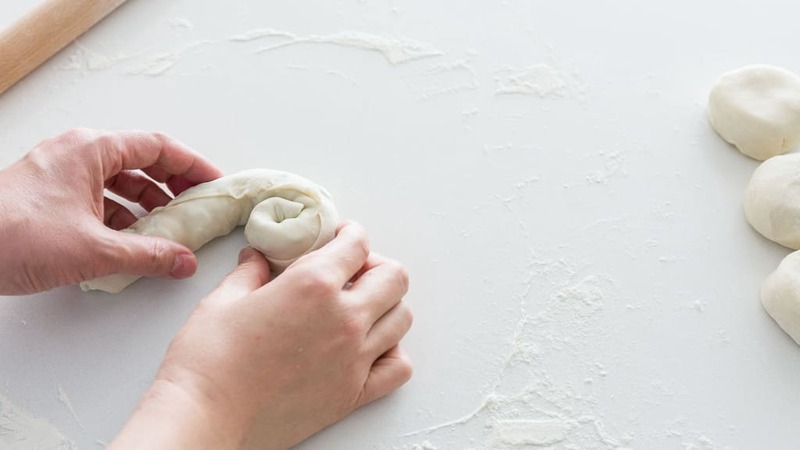 Wrap the rolled dough around itself so it looks like a snail shell, pinching the end to get it to stick. 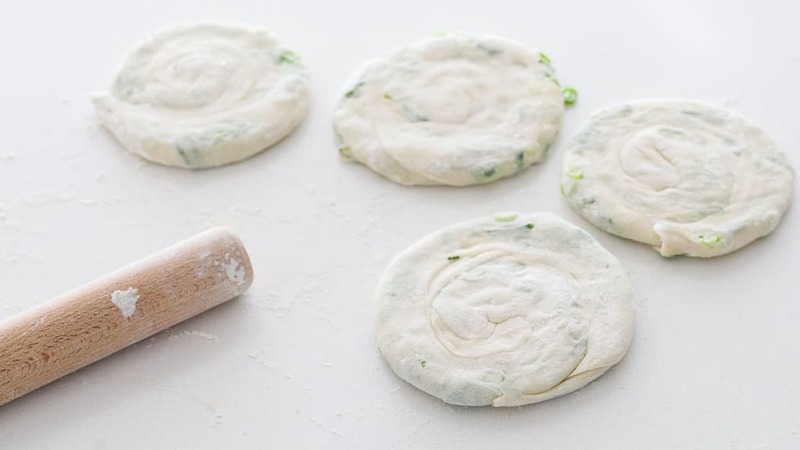 Flatten out the puck of dough with your hand and roll out to a 6-inch (15 cm) disk. 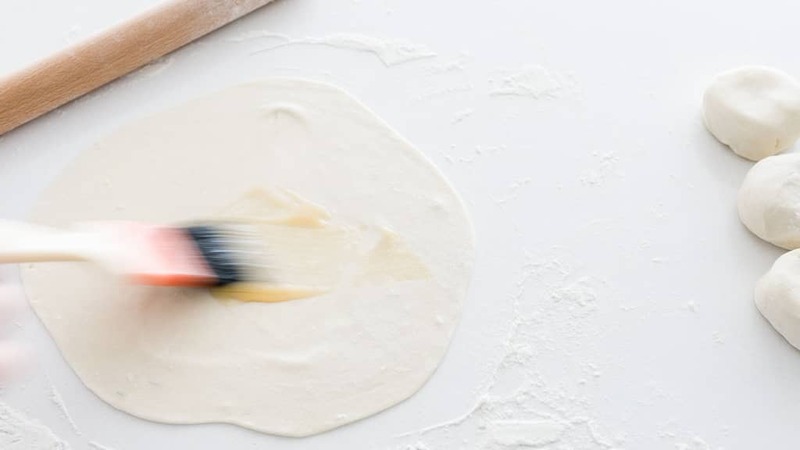 If you want your pancake to have more crunchy surface area you can roll it out thinner, but the problem is that the layers in the dough you just created will fuse together. 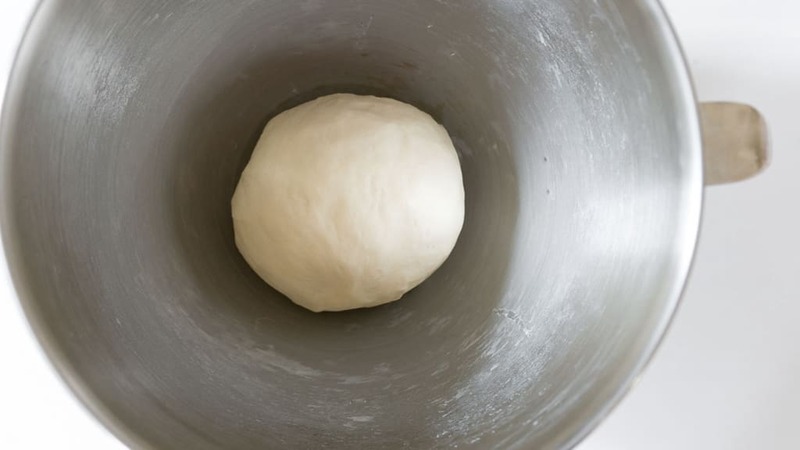 Repeat with the rest of the dough. Add 2 tablespoons of vegetable oil to a heavy bottomed frying pan over medium heat until the oil is hot, but not smoking. Add a pancake and fry until browned on one side (5-6 minutes), and then flip and fry the other side (another 4-5 minutes). 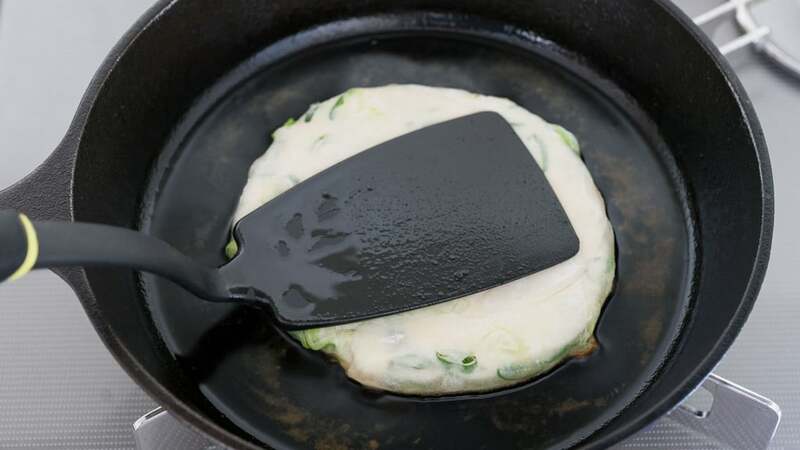 Be careful not to have the heat too high, otherwise the scallion pancake will burn before it cooks through. Fry the rest of the pancakes, adding another tablespoon of oil to the pan before adding each pancake. 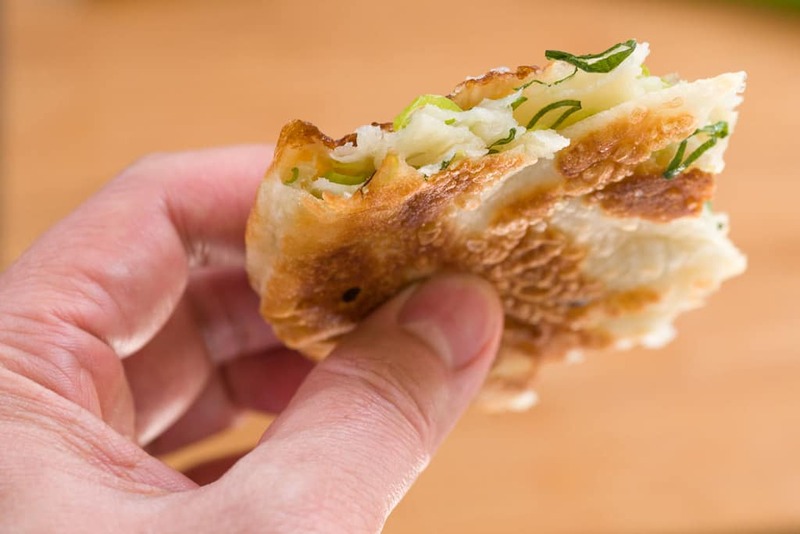 As the scallion pancakes are cooked, transfer them to a paper towel lined wire rack to drain. Serve hot. If you have leftovers, these can be frozen and reheated in a toaster oven. I look forwards to trying this out and, in the meantime, thank you for such a visual feast. Is the flour “all-purpose” or “bread”? I see it listed as both. This looks amazing! I was wondering what to do with the leftover scallions in my veggie drawer, and now I know! Do you think it would be possible to bake them or brush them with oil and put them under the broiler? Or would that ruin the texture…? Thanks Mary, to be honest I’m not sure what baking will do to them since I haven’t tried it. 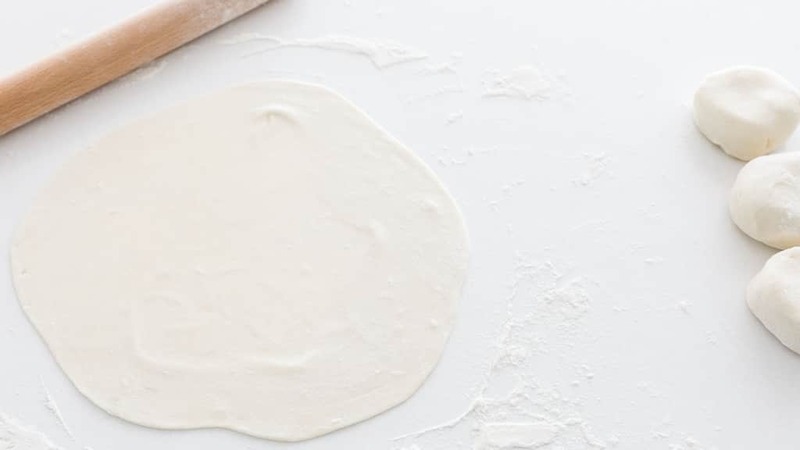 The dough is unleavened (like a flour tortilla), so it does need to be cooked at a high temperature, otherwise it will end up doughy and dense. You may be able to achieve this in a hot oven on a preheated surface like a pizza stone, but I can’t say for certain. Awesome, thank you! I’ll follow the tried- and-true method and maybe experiment with just one of the pancakes to see what happens. Hi Marc! I saw an English chef showing the same shop on tv a couple of days ago, I thought the pancakes looked amazing but they were full of pork fat and that put me off (I’m a vegetarian). I will try your recipe, they remind me a lot of paratha, the indian bread, same rolling and flattening technique. Like eat them before your exams or actually make them for exams?